Plexiform Neurofibromatosis is a complication of neurofibromatosis. The term plexiform comes from the infiltrative growth pattern that looks like plexus or network. Plex means to "interweave" or "plait". In this neurofibromas arise from multiple nerves as bulging and deforming masses involving connective tissue and skin folds. These tumors can be present anywhere in the body. It could be around eye socket, head, neck, arm, leg, chest, abdomen, around spine or anywhere else. It is a benign tumor of peripheral nerves arising from the proliferation of all neural elements. They are deeper lesions effecting nerves and plexus. Plexiform Neurofibromatosis is usually diagnosed in early childhood. They might be present at the time of birth. The tumors grow slowly but can grow into enormous size and cause very serious complications like brain dysfunction, disfigurement and even impinge other organs. They may change into cancer called MPNST or Malignant Perifpheral Nerve Sheath Tumor. Plexiform Neurofibromatosis is an uncommon form of neurofibroma. It is asymptomatic. Both male and females are affected by this problem. It is supposed to be associated with NF-1 which is a genetic condition characterized by skin pigmentation. Plexiform Neurofibromatosis is of two types: Diffuse Plexiform Neurofibromas is soft subcutaneous swellings with not so defined margins and Nodular Plexiform Neurofibromas are spherical shaped and feel more firm and well circumscribed. According to Ayurveda, Plexiform Neurofibromatosis is described as Sir Granthi which means benign tumor. It is a result of imbalance of three energies of Vatta, Pitta and Kapha most importantly Kapha and Vata dosha. Sira means "channels". Overexertion is one of the causes of getting such tumors. Single or Multiple tumors that usually involve a major nerve. Harmless, flat, light brown spots are visible in early childhood. Pain is felt at the affected site. Weakness and numbness in arm or leg is felt. Balance becomes poor. Long bone abnormalities can be seen. Freckles in armpits or groin are seen. Other symptoms include loss of hearing, learning impairment, heart and vessel complications. Loss of vision in some rare cases may occur. Hyperactivity is also a symptom in some patients. Headaches and seizures are common too. Some may experience high blood pressure. Another less common symptom can be oversized head in children, short stature. A complete physical exam is done along with complete medical history of the patient is evaluated to confirm the problem. X-rays, CT scan, MRI of the affected areas and other tests are performed to confirm the problem. Tissue biopsy is done in some cases to arrive at a conclusion. Surgery is the most common line of treatment for Plexiform Neurofibromatosis. Patients undergo a complete removal of tumor without causing any significant neurologic impairment or dysfunction. Long term follow up with regular screening and checkups are needed after surgery. Ayurvedic treatment is very beneficial during the initial stage of the problem as it can reduce the symptoms and prevent further aggravation of the disorder. The treatment focuses on internal as well as external medicines to fully control the problem. These capsules are made from the pure extract of "Ashwagandha" herb also known as Withania Somnifera. The medicine is an excellent immune and energy booster. It enhances the physical and mental capabilities of the body. The medicine works towards balancing the doshas by eliminating excessive toxins out of the body. The medicine helps in reducing the stress and anxiety levels of the patient. Ashwagandha herb is known for its anti-stress and adaptogenic action leading to physical fitness. It stabilizes the blood sugar and also lowers the cholesterol. The medicine is helpful in maintaining healthy cells and tissues and supports healthy growth of cells. The recommended dosage of Ashwagandha capsules is 2 capsules twice a day with plain water after meals. These capsules are prepared using Guggul which is a plant resin from the tree Commiphora mukul. The medicine is an efficient anti- inflammatory product and helps in managing auto immune diseases. It is rich in guggulosterones and helps in healthy cells growth. The recommended dosage for Guggul Capsules is 2 capsules twice daily with plain water. These capsules are very effective in treating Acoustic Neuoma as they are made of curcumin which is known for its anti-microbial , anti-infective, and anti-inflammatory properties . It is the best blood purifier and metabolism regulator. Curcumin is an active compound found in turmeric. The medicine protects the body from the damage caused by free radicals. It supports healthy structure of cells and tissues. The recommended dosage for Curcumin capsules is 2 capsules two times a day with plain water after meals. As the name suggests, these capsules are prepared using standardized extract of herb Tulsi (Ocimum Sanctum). Tulsi is considered to be the most sacred herb and is very effective in treating cancer or tumors and in reducing the ill effects of radio therapy .The medicine supports overall health of the patient and also boosts immunity. The recommended dosage of Tulsi capsules is 2 capsules two times a day with plain water after meals. This medicine is a classical formulation useful in treating cancer, tumors and fibroids as it helps in balancing the kapha dosha. It acts like a catalyst for other herbal medicines to deliver faster therapeutic action. 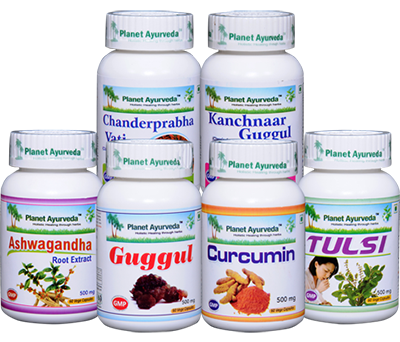 The tablets are a blend of 23 herbs like shilajit, guggul, sharkara, karpoor, vacha, mustak, haridra, amalaka, chvya, vidanga, guduchi, shunthi, maricha, ela, sauvarchala lavana etc. The medicine helps with swelling, nausea and vomiting symptoms. The medicine has a calming effect on the body. The medicine helps in maintaining healthy blood composition. The recommended dosage for Chanderprabha Vati is 2 tablets three times a day with plain water after meals. This herbal product is prepared from the standardized extract of herbs like amalaka, haritaki, bibhitaki, shunthi, marich, pippali, varuna and kachnar bark. The combined formulation has anti-inflammatory and anti-cancerous properties. This medicine helps in reducing the size of cysts or tumors, and is useful in treating all kinds of blockages. The recommended dosage for Kanchnaar Guggul is 2 tablets three times a day with plain water after meals.